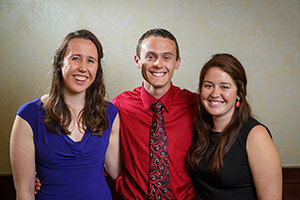 Class of 2014 College of Arts and Letters graduates Patrick Salemme and Olivia Schneider and 2014 College of Engineering graduate Maria Krug are the first recipients of the new International Development Fellowships established by the the University of Notre Dame’s Kellogg Institute for International Studies. The competitive one-year awards place the recipients in field partnerships with three international development organizations. “The International Development Fellowships will allow these new graduates to work in a field that is difficult to enter directly out of college but that is tremendously important,” said Kellogg Institute Director Paolo Carozza. “We are excited about the real-world experience they will gain and the contributions we expect them to make to human flourishing in communities around the world. The program, which is being piloted this year, is expected to expand in future years, said Assistant Director Holly Rivers, who directs the institute’s undergraduate programs and was instrumental in setting up the new fellowship. “We expect the fellows to gain skills in program development, project management, and process implementation that will give them a real advantage when looking for future jobs in development as well as other international careers,” she said. The three new fellows bring deep commitment to international development, strong academic records and significant experience in the developing world to their posts in Kenya, Mexico and Uganda. Patrick Salemme, an anthropology and pre-health studies major, will join Partners In Health (PIH), which works around the world to provide a preferential option for the poor in health care. He will work with PIH affiliate Compañeros En Salud, which is building a primary health care model of excellence in rural Chiapas, Mexico, to assist with a community health worker research study. This fellowship builds on the Kellogg Institute’s close ties to Partners in Health, which was the 2011 recipient of the Notre Dame Award for International Human Development and Solidarity. Olivia Schneider, a political science major with minors in business economics and international development studies, will work in Uganda with the Association of Volunteers in International Service (AVSI), a nongovernmental organization that supports human development with special attention to Catholic social teaching in 38 countries around the globe. Schneider will help to implement the USAID-funded SCORE project, which aims to improve the well-being of critically vulnerable children and their families by increasing household income, food security, and access to legal services. This partnership builds on the Kellogg Institute’s work with AVSI on a major initiative to understand the role of human dignity in development. Maria Krug, a civil engineering major, will work in Dandora, Kenya, with the Kellogg Institute’s Ford Family Program in Human Development Studies and Solidarity, which promotes the study of international human development through the integration of research, learning and on-site community engagement in East Africa. Krug will conduct research, take part in project design and implementation, and help build capacity with local partners. “International development is a topic of enormous interest on the Notre Dame campus,” said Kellogg Executive Director Steve Reifenberg, who will begin directing the institute’s international development studies minor in the fall. Notre Dame students attend classes on development across a range of disciplines and do independent research in the developing world in large numbers. But when it comes to translating their passion into jobs post-graduation, Reifenberg said, many students have found it difficult. “Kellogg programs prepare students for this critically important path while they are at Notre Dame, and we are delighted to offer this new opportunity for professional experience,” he said. Originally published by Joseph McNally and Elizabeth Rankin at news.nd.edu on May 06, 2014.